Apple has released the 4th beta version of iOS 7.1 to those registered with the iOS Developer program. As usual with these updates, the release focuses on improving performance and refining features, resolving bugs, and making other adjustments to system functionality. 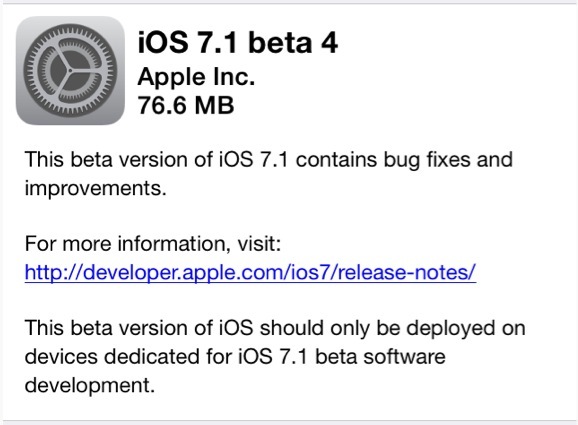 Developers who are currently running iOS 7.1 beta 3 can download beta 4 through Over-The-Air, accessible through Settings > General > Software Update. The OTA update is versioned as build 11D5134c, and weighs in between 70MB and 200MB, depending on the iPad, iPod touch, or iPhone being installed upon. Those who would prefer to install the update through IPSW can find firmware files and a new version of Xcode available through Apple’s Developer portal website. The updated beta release represents Apple’s progress towards releasing the first major update to iOS 7 to the wider public. Though Apple hasn’t specified a particular schedule for a public release of iOS 7.1, developer beta versions of iOS typically run through six to eight revisions before turning into public. At the current release cycle rate of roughly a new beta every other week, users could expect to see the 7.1 public release date sometime next month, though this is obviously just speculation based upon past scheduling. We at OSXDaily usually don’t cover specifics of beta software releases because they are constantly changing (and released under an NDA which few seem to acknowledge), but those interested can find further details about the newest release on a MacRumors Forums thread about the topic.